WHAT MAKES LUBE DOC DIFFERENT? Average wait time is only 10 minutes. No pressure & great customer service. Complimentary Vehicle Inspection with Emissions Test! Same local owner for over 30 years. We establish a CARFAX maintenance history. At Lube Doc in Orem, Utah, we offer complimentary vehicle inspections with the purchase of an Emissions test and preventative maintenance through oil changes, transmission and radiator services. These keep your car running better, longer. We also make it easy to get your car registration done. We can give you your decals right here, no trip to the DMV! And rest assured, since we don’t do most repairs, your Emissions test will be fair- we want you to pass! Stop in today, no appointment necessary! Forget waiting at the DMV. Just stop in at Lube Doc to have your vehicle registered and receive your license plate decal! How does it work? Lube Doc is an On The Spot authorized renewal station, allowing us to complete your registration renewal. We are authorized by the Utah Division of Motor Vehicles to renew your vehicle, give you a new decal, and a new Registration Certificate. Get Emissions with a complimentary vehicle Inspection, and new registration all in one stop. In fact, Lube Doc will give you a $10 off coupon for your next oil change if you just come in and register your license plate decal! Oil is available in supreme oil, synthetic blend, high mileage oil, and full synthetic. Please show all coupons to the cashier. If I don’t have my registration, can I still do my emissions test? Don't get caught with an expired registration! Stop by Lube Doc for an On The Spot Renewal. These metal supported wipers come with a special coating on the blades to help repel moisture. Premium wiper blades that conform to the shape of your windshield. Air filters keep dust and debris from entering your engine’s intake. If the filter is clogged, it can affect your vehicle’s performance. It can even lower your gas mileage and lessen your car’s power. Make sure you get your air filter replaced within the recommended time, so that your vehicle can run at its peak performance. We test the Cold Cranking Amps on your battery and can install a new battery if you need. Our batteries come with a warranty and an additional pro-rated warranty. Our Transmission Flush Machine uses 20 quarts of new fluid which meets manufacturer specs, to quickly and efficiently exchange 100% of your vehicles transmission fluid. The transmission pan is cleaned, gasket and transmission filter are replaced, then the transmission is filled to the proper level with transmission fluid which meets manufacturer specs. This service drains the fluid from a manual transmission, flushes 1 quart of new oil, and fills to proper level with new fluid. I don’t think I will ever go anywhere but here from now on. Every time I come I am treated so well. Staff is always so helpful, considerate and knowledgeable. My car maintenance is always quick and done with a smile. Chris especially is always so happy and cheerful, which makes a difference. I haven’t been treated this well anywhere else. They will have my business for a long time. I highly recommend! I got an oil change here yesterday; I’d had some poor experiences a different mechanic shop, so I decided to try Lube Doc. They were amazingly quick (15 minutes), vacuumed out my car, checked all my fluids and tire pressure, and ACTUALLY ASKED before replacing things (and didn’t pressure me into replacing anything I didn’t want to). Asher was the guy who did my oil change, and he went out of his way to make it all a great experience. These guys were really friendly and informative. The check in and payment process was easy and they didn’t try and sell me a bunch of stuff. The oil change I had done was unbelievably fast even with having a high volume of traffic. Definitely would recommend! 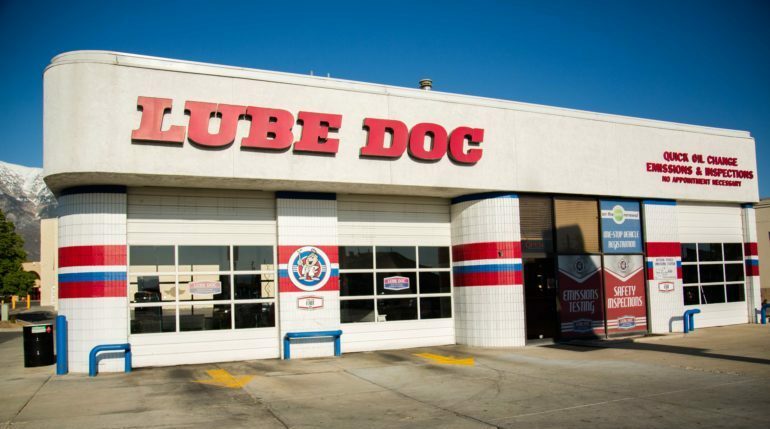 "I am VERY pleased to write a letter of deep appreciation to Chris and all of the guys at Lube Doc. For as long as I can remember (way over 15+ years) I have been bringing my vehicles to Lube Doc. They have treated me and my vehicles as if they were their own, which has made me consistently return for the excellent service they have to offer. Chris and the guys at Lube Doc have made me feel like family and I am sure they have treated the rest of their customers the same." "I started going to Lube Doc when I lived in Orem. I then moved to Spanish Fork and tried a few other places for my vehicle services. After trying a few different places I now drive from Spanish Fork to Lube Doc in Orem every time I need a service done on my vehicles. Their customer service, professionalism, quality of work, and price are better than any other place I have ever been." "Just want to say what great service I have always gotten at Lube Doc. Been with you guys for a long time and have never been disappointed in your care and attention for my vehicles. I live in Salt Lake and feel it is worth the drive down to Orem. I am confident in saying you are the best in the state." "I want to thank the Lube Doc family for taking care of my cars for over 15 years. It’s nice having the same people there year after year committed to giving me excellent and honest service. I don’t have to worry when they recommend something that my car might be needing to protect from future problems."